Any painting from this collection is a pure extract of being led by "from above". It is an experiment with my approach towards creation. Some of these paintings have been evolved for 17 years. Usually, the artist paints focusing on the vision of what he wants to depict on the canvas. He considers the composition, colours, structures and the main idea. When working on these little (big) pieces, I let myself be carried away. When developing these paintings, I would freely scribble on high-quality papers placed around, without considering matching colours or anything else. The final outcome is completed by handwritten texts. 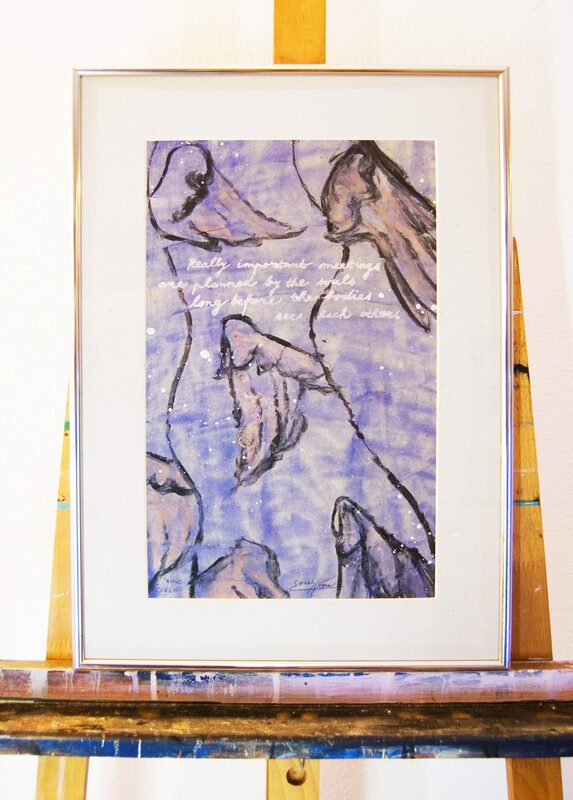 Whether it being a supportive quote, poem or lyrics, I have always been extremely lucky in finding a fitting text for each and every painting. Each artpiece is covered by glass and in frame. This is an original artwork, made with love and passion, and it goes with signed Certificate of Authenticity. When creating these pieces, I have felt joy and freedom. I hope these are the same emotions brought by them to you. For Joy XXXIV. contains a quote from Paulo Coelho: "Really important meetings are planned by the souls long before the bodies see each other."